What to do with Sarah Palin’s $1200 energy check to Alaskans? I got my $1200 energy rebate check from Sarah Palin a couple weeks ago, and so did every other human being in Alaska. This money, which came from the wealth of oil companies doing business in Alaska, got spread around by the Governor to help Alaskans defray the rising costs of energy that made the oil companies profitable enough to provide Alaska with the money for the rebate check that defrays the cost of energy…..(you get the circular idea). At the Alaska Women Reject Palin rally here in Anchorage, a woman drove by as I was returning to my car. She leaned out of her window and said, “Are you going to get a $1200 check this year?” “You mean the rebate check? Yes,” I said. “So how can you hate Sarah Palin!? !” she quipped, looking angry and smug at the same time. “Are you going to SPEND it?? ?” she spat. I said the first thing that came to mind, “Yes, I’ll probably donate it to the Obama campaign.” She screeched away. And I didn’t tell her the whole truth. I’ve actually spread my wealth around to lots of good progressive candidates, both in Alaska and outside. In the spirit of acknowledging all the disingenuous lies and distortions of the McCain-Palin campaign, I made up this headline. But, unlike the McCain-Palin campaign, I acknowledge that it’s not true. So, why is anyone voting for the McCain-Palin ticket at this point? This guy has nailed it. McCain needs help with economy–his choice? If you’re sick and tired of John McCain’s non-stop stream of lies about Barack Obama’s tax plan, this video can help you put an end to it. From JedL over at DailyKos comes this gem. As the video shows, the fact is that under Obama’s plan, 95% of Americans — including Joe the Plumber — would get a tax cut. Income over $250,000 would be taxed at pre-Bush levels (same as during the Clinton years). That’s not spreading the wealth — that’s a tax plan designed to create wealth by strengthening the middle class. Don’t tell Matt Drudge or FOX News, but John McCain himself took the same basic approach to taxes as Barack Obama — at least until the 2008 presidential campaign brought about some changes in his views. Now, with just six days to go, the only thing John McCain has left to run on is a bogus and hypocritical attack on Barack Obama’s tax cut plan. To the extent this video can help reveal that truth, getting it into enough hands could help put an end to John McCain’s lies about Obama’s tax cut plan. When things are going well, they’re going really well. 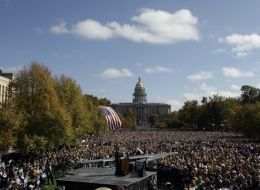 Barack Obama drew approximately 100,000 people to a rally in Denver today. Guess folks want to see the next President of the United States. I happened to receive a John McCain solicitation trying to raise money. Immediately made me donate another $100 to Barack Obama. Don’t worry–I’ll send in the GOP fund-raising solicitation (they pay the postage) and let them know I donated money to Barack Obama in John McCain’s name. We’ve reached a critical juncture in the campaign. The Obama Democrats and their left-wing, special interest allies have come forward in a united front combining their enoromous fundraising arsenal. Meanwhile, the national Democrats led by Chairman Howard Dean are stepping up their cynical campaign of distortions and outright lies, and with the help of their cronies, are raising staggering amounts of money. My friend, the last thing we Republicans can afford is to have our hands tied behind our backs due to the fact that their candidate broke his promise to the American people and refused to accept the presidential campaign spending limit–which means they will have no limit as to what they can raise and spend. We simply can’t be in a situation where the Democrats hold a huge financial advantage over us in the last crucial month leading up to the elections. That’s why I am writing to you today, as a most valued and trusted member of our Party. You support is essential right now. So, please send in a generous Emergency Membership Contribution of $35, $50, $100, $500 or even more if you can afford it. …I would not ask for your help if the circumstances were not so dire. However, it is clear that the weeks and days ahead will be the most important yet in our battle to defeat the Democrats and their deeply flawed policies that embrace higher taxes, more government spending, socialized medicine and surrender in Iraq. …Thank you for your steadfast support of our Party and our country. You are currently browsing the Democrat Dave's Blog blog archives for October, 2008.